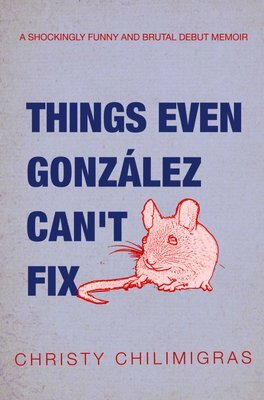 "Things Even Gonzalez Can't Fix" is the shockingly brilliant debut memoir of a 24-year-old Greek South African girl, Christy Chilimigras. It is nothing like "My Big Fat Greek Wedding". Although there are old women in black plucking stray hairs from their chins, the nuts in the baklava appear by way of a dash of crack cocaine, a sneaky brand of sexual abuse and cereal Tupperwares, packed to the brim with dagga. It is also very funny. "Things Even Gonzalez Can't Fix" is also a disturbingly brutal story about two sisters, raised by a father who has been sexualising them since they were toddlers. A book that simply pulsates with edgy originality, that unleashes a Millennial’s unapologetic perspective of our world, Christy Chilimigras is a new voice that demands to be read. Not since Kopano Matlwa’s "Coconut" has a book promised to shake perspectives and overturn the way we see things.